1 This was my assumption in ‘Major John Cartwright and Radical Parliamentary Reform, 1808–1819,”; E.H.R., LXXXII (10. 1968), 717, and it likewise appears in Halévy, E., The Liberal Awakening, 1815–1832 (2nd rev. ed., London: 1949), p. 11; White, R. J., Waterloo to Peterloo (London, 1957), p. 133; Davis, H.W.C., The Age of Grey and Peel (Oxford, 1929, reprinted 1964), p. 168;Wallas, G., The Life of Francis Place (London, 1898, 4th ed. 1925), p. 62;Veitch, G.S., Genesis of Parliamentary Reform (London, 1913, reprinted 1965), p. 344. 2 Cartwright, F.D., Life and Correspondence of Major Cartwright (London, 1826), II, 381, hereafter cited as L. & C.
3 Besides being a reformer, Northmore was a geologist, a Fellow of the Society of Antiquaries, and a Justice of the Peace in Devonshire. He contested unsuccessfully both Exeter and Barnstaple in 1818. D.N.B. His friendship with Cartwright began in 1798. L. & C, 1, 255. 4 The Holt White Papers, The Gilbert White Museum, Selborne, Hampshire. Letters in the Holt White Papers will be followed by a number indicating their place in the collection. Thomas Holt White of Chase Lodge, Enfield, Middlesex, was a nephew of the famous naturalist. Cartwright's correspondence with him began in 1801 and continued to the end of Cartwright's life. 5 Miller, N.C., op. cit. pp. 715–16.Roberts, Michael, The Whig Party (London, 1939, 2nd ed., 1965), pp. 287–8. 6 Northmore to Holt White, 6 June 1811, Holt White Papers, no. 430. Northmore's name appears in the lists of those who attended the meetings of 30 Mar. and 6 Apr. which suggests that his idea for a club was influenced by the effort at union between members of parliament and popular reformers. 1 7 Northmore to Holt White, 6, 24 June 1811, nos. 430–1. A list of members as of 15 June 1811 includes the following: E. Blounr of Staffordshire, W. J. Burdett of Somersetshire, Montague Burgoyne of Essex, Peter Du Cane of Essex, Walter Fawkes of Yorkshire, G. Johnstone of Yorkshire, R. Lewis of Monmouthshire, W. Peter of Cornwall, Sir J. Throckmorton of Berkshire, J. B. Trevanion of Cornwall, T. Holt White of Middlesex, G. Wilbraham of Cheshire, F. Canning of Warwickshire, Wolseley, C. of Staffordshire, Williams, W. of Dorsetshire, and Northmore himself. 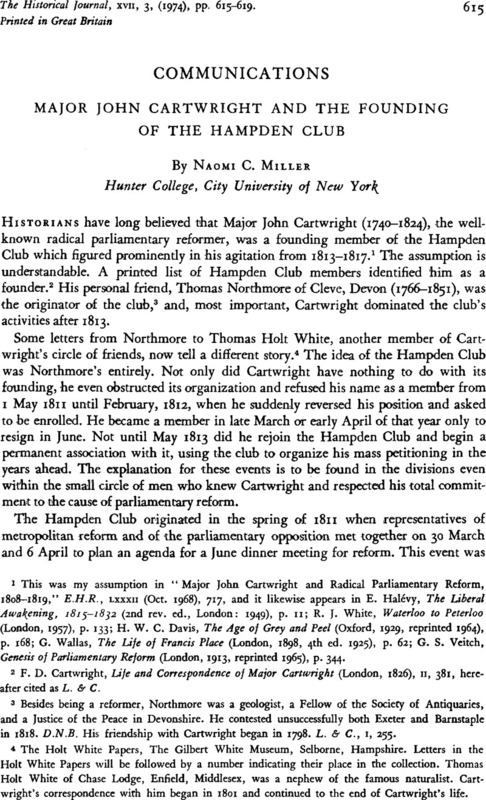 Circular, Hampden Club, 1 05 1811, no. 455. L. & C, II, 24& C, II, 30–32 Wyvill perceptively noted that the absence of a defined programme opened the door to radical agitation. Probably for the same reason, Cartwright later opposed any change in the constitution of the Hampden Club. Dinwiddy, John, “ Christopher Wyvill and Reform, 1790–1820,” Borthwick Papers, no. 39 (Borthwick Institute of Historical Research, York, 1971), p. 24 and n. 138. Cartwright to Holt White, 1 Oct. 1813, no. 369. A desire to modify the rules of the Society of Friends to Parliamentary Reform decided reformers to begin afresh with a new name and a new society, the Union for Parliamentary Reform according to the Constitution, L.& C, 11, 375–8. 10 Cartwright to Roscoe, op. cit. 11 L. & C, II, 10-II,371–5. Northmore to Holt White, 6 June 1811. The three names are absent from lists of Hampden Club members. 12 Cartwright to Roscoe, 24 Feb.. 15 May 1812. Cartwright to Wyvill, 21 May 1812, L. & C, n, 17. Cartwright urged petitioning in Ireland as well at this time, Cartwright to Lord Fingal, 24 Feb. 1812, ibid. 11, 22–4. 13 Northmore to Holt White, 24 Feb. 1812. 14 Northmore to Holt White, 6 June 1811. 15 Cartwright to Holt White, 9 Aug. 1813, no. 367. 16 Walter Fawkes, who favoured the radical programme, was also prepared to accept triennial in place of annual parliaments. Dinwiddy, John, op. cit. p. 21 and n. 117. Cartwright to Holt White, 24 June 1809, no. 359. Pearson to Holt White, 31 July 1809, no. 556. Northmore to Holt White, 6 June 1811. Burgoyne based his attendance at a Union Society meeting on Cartwright's promise to remain silent on the subject of annual parliaments. Burgoyne to Holt White, 10 June 1812, no. 413. 17 L. &C, II, 26–30.